We want to provide a safe experience for users to get apps and a fair environment for for all developers to be successful. If you believe we have misunderstood or misinterpreted the intent of your app, you may submit an appeal for consideration or provide additional clarification by responding directly to this message in Resolution Center in iTunes Connect. Weird aye? I realize that some (maybe most) fancy-pants – for whom being an Apple Developer is a full-time job and not a hobby like me – may know the above rule/logic already and wouldn’t be surprised by Apple’s bringing it up … but personally I find it a bit surprising since A) I took quite a bit of time making the app UI/experience very clean and responsive and B) … I give the jerks $100 bucks every year just to keep my Apple Developer license active!! I of course wrote them back trying to explain that while I realize it’s not some world-saving feature-packed app, the core usefulness of the app is based on a feature/need that 99% people who are “mobile web browsing” (or desktop/laptop web browsing!) don’t have a solution for (i.e. “resuming video!”) … but no idea if they’ll reconsider. Thank you for your prompt response. Due to recent policy changes apps which primarily interact with content aggregated from the internet are no longer appropriate for the App Store. As the main features of your app revolve around watching, saving, and resuming aggregated videos we have found the app to not be in compliance with guideline 4.2.2. Once the app has been modified in order to address this rejection we would be happy to resume our review. Well I submitted a formal written “appeal” to the App Review Board. I actually was starting to think my case was pretty solid … but sadly, they still don’t see things as I do. My appeal and their response below for the record. I have to say it seems beyond INSANELY SILLY to have to write all these words about an app that’s all about keeping you efficient and saving time! Lordy the irony is killing me. I’m not sure if Apple will take down the existing version of the app from the App Store or not (still there as of today). I’m too scared to ask them directly fearing they may take it down after I ask … so for now I’ll be quiet and hope they leave it there for now (?). As for what’s next I don’t know. Maybe I’ll think of a way to make it do more stuff so the App Review board approves it – though the notion of forcing functionality like that seems like a dumb idea (even though they basically are suggesting that). Or maybe I’ll just port it to a web app. Who knows … too busy with my Super POTUS Trump game right now to deal w/it. Thank you for the opportunity to submit an appeal for my app ResumeTube to remain on the App Store. Firstly, I agree with the general notion posed by the App Review team that my app ResumeTube is a web content aggregator of sorts in that it’s primary content is a user-curated list of videos from YouTube and Vimeo. I disagree, however, that this means the app fails to pass Design Guideline 4.2.2 and/or doesn’t deserves to remain on the App Store (as it has for 1-2 years now). * Neither YouTube nor Vimeo currently allow users to “resume” where they left off in a video. * For example, if a user was watching a 1 hour video tutorial class on learning Swift or Objective C (or maybe a 2-3 hour Apple Keynote video) and they had to stop watching and finish it later, when they came back another day they would they have to scrub around the video trying to remember and find where they left off. * This act of scrubbing around a video trying to find your place is inefficient, frustrating and often leads to people giving up and not bothering to finish watching the video in the first place. * Additionally, this video scrubbing can sometimes even strain a WiFi/router to the point of having to be restarted due to the bandwidth choking/throttling caused by excessive scrubbing. Multiply this times X number of people in an office or household (like me) with often kids and parents both competing for bandwidth, this situation/scenario is even worse. ResumeTube was created to solve the above problem(s). Yes it’s content consists 100% of YouTube or Vimeo videos ** just as Instapaper’s content consists 100% of web articles ** … however it serves as a small but powerful solution to giving the user a more efficient, and less-frustrating experience. Simply stated – ResumeTube saves users’ time and frustration and encourages the consumption of more video content vs. less. If YouTube or Vimeo one day (finally) introduce the ability for users to “resume” where they left off in a video then I would admit ResumeTube’s wouldn’t/shouldn’t need to exist – or at the least the need for its existence would be fair to reassessed. However as of today if ResumeTube is taken off the App Store I, my colleagues and however many other people have purchased the app, will have to return to the world of scrubbing around videos trying to remember where we left off – and sadly giving up a lot of the time. There are other aspects of ResumeTube that I believe make it worthy of remaining in the App Store but the above points sum up the most important things – which again really boil down to: if ResumeTube is taken off the App Store, myself and other users will A) become less efficient, B) lose value we previously had in our iPads and C) watch fewer web videos. 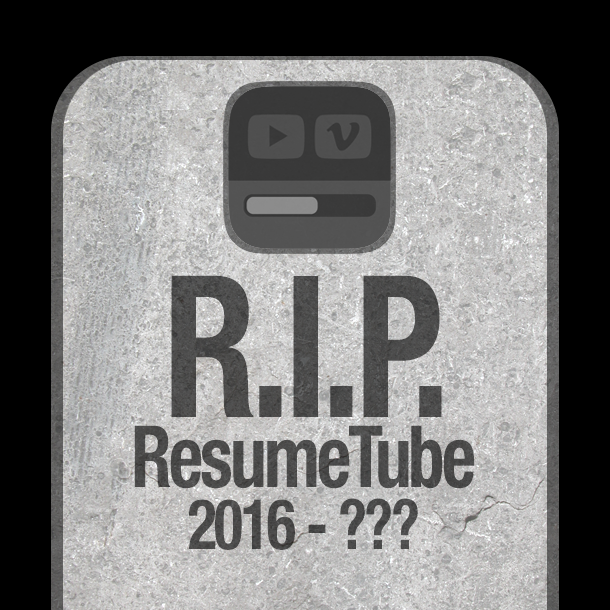 Please do consider my points above and do approve ResumeTube to remain on the App Store! Let me know if you have any follow-up questions. We are writing to let you know the results of your appeal for your app, ResumeTube. The App Review Board evaluated your app and determined that the original rejection feedback is valid. Your app does not comply with App Store Review Guideline 4.2.2.To resolve this issue, please ensure your app includes features, content, and UI that elevate it beyond being primarily a repackaged website or marketing materials.We hope you will consider making the necessary changes to be in compliance with the App Store Review Guidelines and will resubmit your revised binary.For questions regarding your app’s review, please respond in Resolution Center in iTunes Connect, where a reviewer who is familiar with your app can assist you. This entry was posted in Development, iPad and tagged apple, iOS, ipad, ResumeTube. Bookmark the permalink.